The patented Polymed system from DaklaPack Group, the number one choice for sending diagnostic specimens between 2 addresses especially 2 fixed addresses. 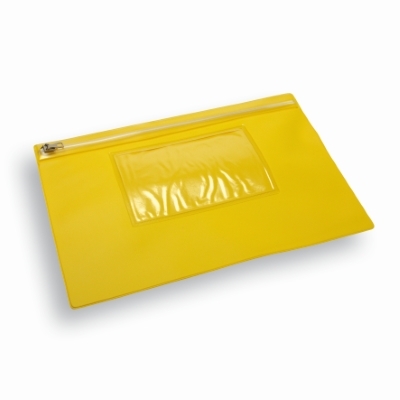 Constructed from a strong PVC vinyl which can be used hundreds of times, and easily opened and closed via the easy to use zip closure. On the front of the Polymed you will see a clearly visible transparent window dimensions 80mm x 120mm, insert your double sided address card into the window and pop the Polymed into the post box, upon return the returner only needs to flip the address card and can easily send it back to you. No more labels and no more writing by hand. The Polymed system should be used in combination with the DaklaPack Transportblister, Safetybag and Absorbing Material. The Polymed system is then suitable for sending via the post box, saving you time, money and even better most of the packaging can be reused. Available in red, green, blue, yellow and white. – Do we not have the size you are looking for? We can possibly have it made for you, drop us an email via the contact button for further assistance.